Abstract: This article provides a local history of the real estate practice known as Blockbusting, which was a tactic utilized by realtors throughout the post-World War II period as a means of inciting racial fear in urban and suburban neighborhoods. By inciting fear of possible racial integration of a neighborhood, realtors could purchase homes at below market value from one owner and then resell them to minority customers at more exorbitant prices. In 1961, New York State outlawed the practice and, in 1962, leveled the first charges of Blockbusting against a real estate firm in New York State. That firm was located on Long Island and this piece is an analysis of the case against the realtors charged, one of whom lost his realtor’s license as a result. On November 1, 1962, Gerald Kutler, a real estate agent from Islip Terrace, had his realtor’s license revoked by the Department of State of New York. After a series of public hearings were held in New York City, the Secretary of State’s Office found that, based upon witness testimony, Kutler’s practices in the North Bellport area had been in violation of Rule 17 of New York’s Real Property Law. Adopted in 1961 by New York’s first female Secretary of State, Caroline K. Simon, Rule 17 outlawed “blockbusting,” thus making it illegal for realtors to incite racial hysteria, panic selling of homes, and, ultimately, rapid demographic shifts in communities across New York State. While this addition to the Realtor’s Code of Ethics and Real Property Law was adopted as a statewide measure, its origins and its first successful usage occurred on Long Island. Roughly one year before Rule 17 was implemented, allegations of “blockbusting” were levied against realty firms in New York City as well as in Nassau and Suffolk Counties. These alleged instances had been reported to both the Department of State and the Department of Justice of New York. Hoping to stifle the practice and help maintain stable suburban communities, charges were quickly brought against Gerald Kutler and his colleagues at Captree Realty, the latter of which was based out of Bay Shore. This article examines the case against this firm and the impact its principal defendant had upon the North Bellport area. Fig. 1. Map of North Bellport, United States Census Reference Map, 2000. United States Census Bureau. While “blockbusting” as a real estate practice has been investigated extensively by historians, they have yet to shed light on the case of Gerald Kutler and the demographic shifts that emerged as a result of his tactics. Due to the significance of the case as the first of its kind in New York, it is rather surprising that it has sat upon the proverbial shelf for the past half century. Even in studies that have highlighted suburbanization, residential discrimination, and social movements on Long Island, it has routinely been left out of the published discourse. In Picture Windows: How the Suburbs Happened, Rosalyn Baxandall and Elizabeth Ewen provide readers with an intriguing analysis of “blockbusting,” its impact, and the battles waged against it in both Roosevelt and Freeport. In the case of the latter community, the authors explain, local residents were successful in fending off “blockbusting” realtors by taking their concerns to New York’s Department of State. Despite the fact that, in 1964, four local realtors ultimately lost their licenses as a result of their activities, there is no mention of Rule 17 or the precedent-setting cases that came before. This article will, therefore, serve as an introduction of this earlier case into the local literature and dialogue on “blockbusting” and its impact on the North Bellport community in the 1960s. In order to fully understand how this neighborhood became a prime location for an “unscrupulous” realtor to descend upon in hopes of turning a quick profit, the histories of – and the tenuous relationships between – both the historic Village of Bellport and the more recently established hamlet of North Bellport must first be discussed. Fig. 2. Long Island Submarket Map. Wikipedia. Located roughly sixty miles east of New York City on the south shore of Long Island, Bellport was first incorporated as a village in 1908. Despite this early twentieth century designation, however, the Bellport area had served local inhabitants for hundreds of years prior. Originally occupied by local Native American peoples who utilized the waterfront as a staging ground for a local fishery, the Bellport area was acquired and later inhabited by white, European immigrants beginning in 1664. In successive decades, these early residents followed in their predecessors’ footsteps and capitalized on Bellport’s prime location through their participation in marine-based trades and industries which included, among others, fishing, whaling, and ship-building. These early residents also farmed the local landscape for sustenance and sold cord-wood to supplement their marine-based incomes. By the mid-nineteenth century Bellport had developed into a rural vacation resort area for New York City’s upper-class elites, which included “some of the most prominent people in the social, business, and artistic world.” By the late nineteenth and early twentieth centuries, the area’s eclectic past, resort-like atmosphere, and proximity to “nature” had drawn many of these same individuals to take up permanent residence in Bellport, which, over time resulted in the expansion of upper-class amenities. These included not only a public beach for bathing, but a country club, a yacht club and a public dock for private vessels as well. Throughout the post-World War II era, this luxurious past inspired a variety of middle to upper-class professionals to seek out Bellport Village as a residential haven in the suburbs. In particular, the waterfront locale attracted the employees of the nearby Brookhaven National Laboratory which opened in 1947. The majority of these employees represented the educated elite, having been trained as research scientists at prestigious universities in the United States and around the world. 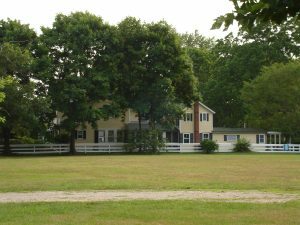 Coupled with Bellport’s illustrious past as a picturesque, vacation resort area, the presence of this affluent constituency made Bellport a highly desirable community, one which increased in value throughout the postwar period and beyond. For example, from 1960 to 1970, the average home value in the village increased from $16,500 to $23,090. At the same time, the primarily white neighborhood’s average household income in 1970 was the second highest in the surrounding area at approximately $12,500 – a figure which exceeded the average family income of the entire Brookhaven Township by roughly $1,350. 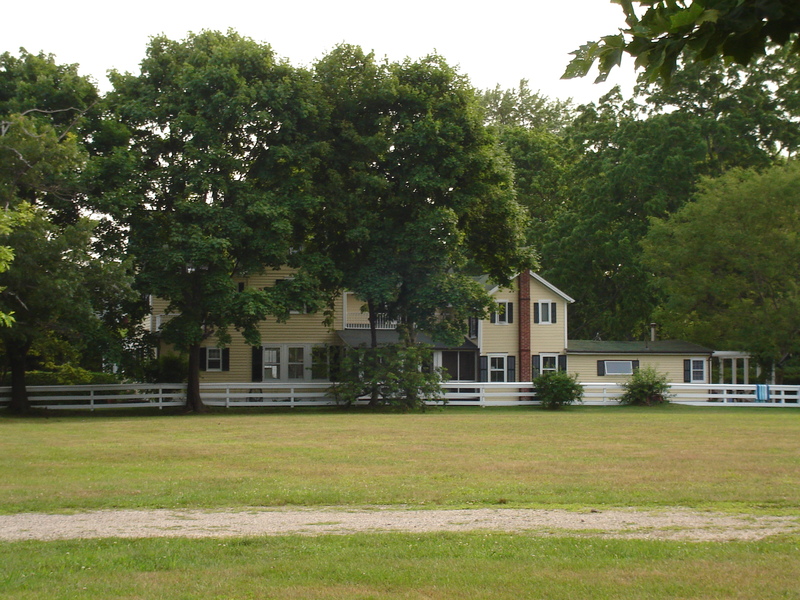 While Bellport Village would certainly attract would-be suburbanites representing a host of other professions, including, among others, teachers, doctors, lawyers and business people, the presence of such prominent research scientists and the tranquil past of the area they inhabited would, on many levels, come to define Bellport Village throughout the postwar period. Fig. 3. 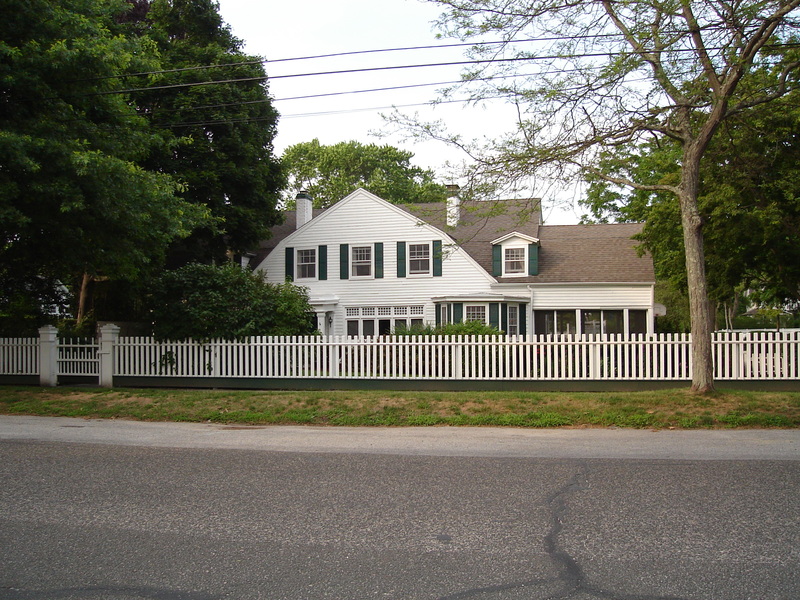 Home in Bellport Village, 2005. Photograph courtesy of author. Fig. 4. 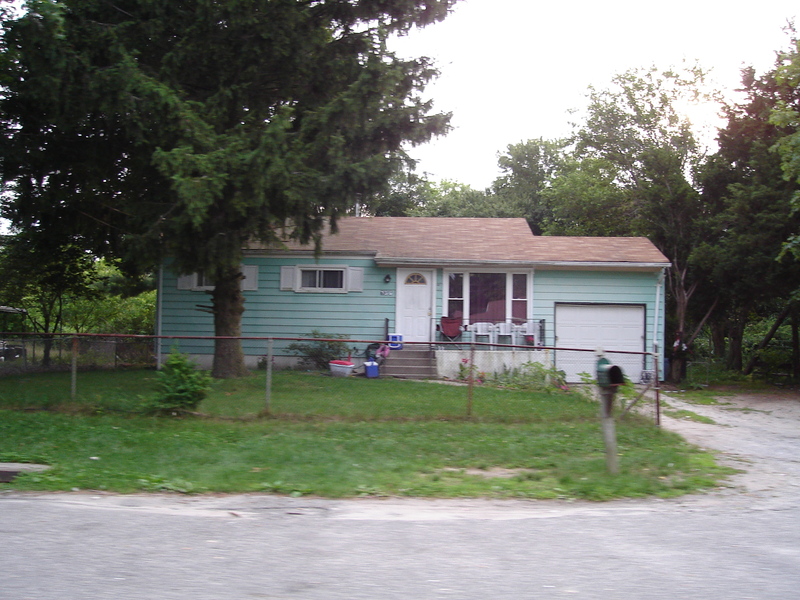 Home in North Bellport, 2005. Photograph courtesy of author. Fig. 5. 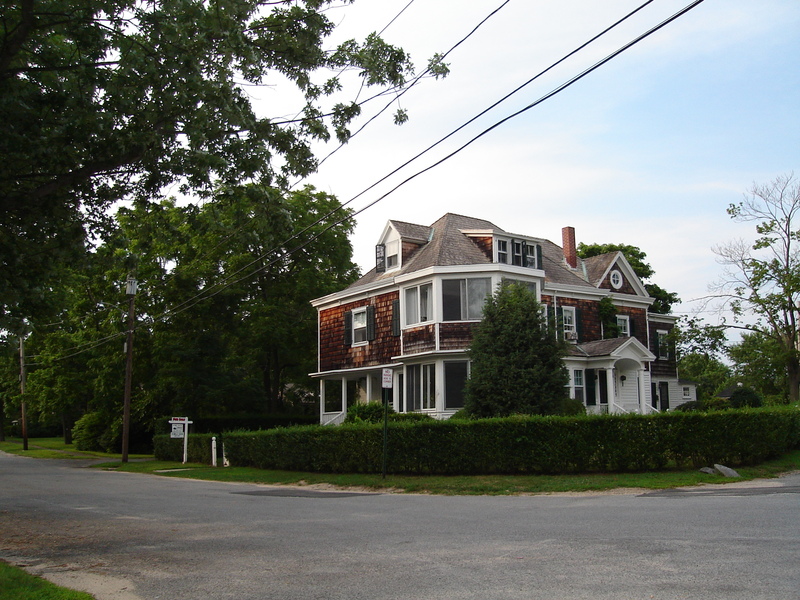 Home in Bellport Village, 2005. Photograph courtesy of author. Fig. 6. 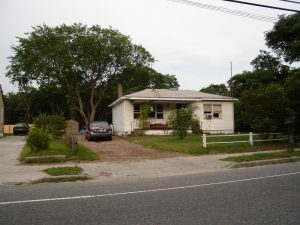 Home in North Bellport, 2005. Photograph courtesy of author. This stigmatization only intensified as the 1950s came to a close and North Bellport slowly began to integrate, as many of the neighborhood’s original white homeowners were forced to sell their properties and relocate in the wake of widespread layoffs at Republic Aviation. 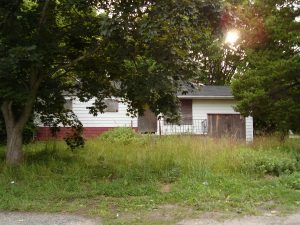 While many of these outgoing residents sold their homes back to lien holders, others either lost them through bank foreclosure or simply abandoned them before such action could be taken. In turn, many of these homes were purchased by local real estate speculators, who sold or rented them to other would-be suburbanites, including many of the neighborhood’s first African American and Latino residents. Beginning in the spring of 1962, Gerald Kutler, a newly licensed real estate agent, began using these early pioneers as scapegoats in a “blockbusting” scheme that would eventually lead to the loss of his license later that same year. Fig. 7. 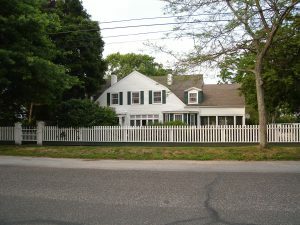 Home in Bellport Village, 2005. Photograph courtesy of author. Fig. 8. 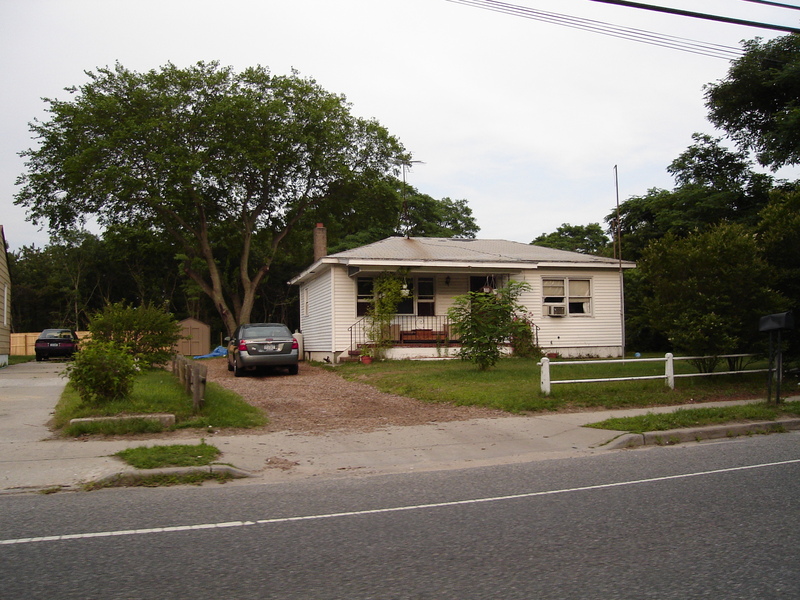 Home in North Bellport, 2005. Photograph courtesy of author. They began by selling a house in an all-white block or neighborhood to a black family, or using devious techniques like paying a black woman to walk her baby through a white neighborhood to fuel suspicion of black residential “take-over.” Most susceptible to the manipulation of real estate brokers were whites who lived near the borders of predominantly black neighborhoods… [Real estate brokers] bought houses from panicked white sellers at below-market prices…Then they placed ads in African American newspapers, offering residents of overcrowded and substandard inner-city housing the chance to escape. They quickly sold the houses at substantial markups to blacks willing to pay a premium for good-quality housing in an ostensibly racially mixed neighborhood. While this explanation of “blockbusting” is linked more to urban residential discrimination than that which took place in postwar, white suburban enclaves, the tactics were virtually the same. Realtors incited panic, purchased low, and then sold high. As local residents would assert in sworn testimony, this was exactly what they believed Gerald Kutler and his colleagues were attempting to do in North Bellport and the surrounding neighborhoods in the spring and early summer of 1962. In the eight years that followed the Kutler case, North Bellport’s racial, ethnic and socio-economic composition would radically shift, as the once predominantly white, working-class hamlet would witness an 856% jump in its African American and Latino population. While North Bellport’s white population decreased from 4,154 in 1960 to 3,417 in 1970, its non-white population ballooned from 265 to a staggering 2,486. This increase proved most significant in the surrounding area, as Bellport Village would only witness an in-migration of fifty-seven black and Latino residents, rising from a meager thirteen to seventy. Similarly, the black and Latino populations of nearby East Patchogue and Patchogue would only increase from twelve to fourteen and from 222 to 299 in the same ten-year period. The only comparable increase in the local African American and Latino population would occur in nearby Yaphank, a community which would witness an in-migration of 194 minority residents, rising from 157 in 1960 to just 351 in 1970. While these demographic shifts cannot be fully attributed to the “blockbusting” tactics employed at the beginning of the decade, they do signify that in the 1960s North Bellport was a neighborhood in flux. Whether Kutler and his tactics were the catalyst for this evolution or simply a response to its beginnings cannot be ascertained. In the fall of 1962, however, his attorneys would argue that he was, in fact, the latter of the two. By the time that Gerald Kutler received his realtor’s license from New York State on December 29, 1961, the state’s addendum to its Real Property Law banning the practice known as “blockbusting” had been in place for just over six months. Instituted by the Secretary of State’s Office that June, “Rule 17” stated that: “no broker or salesman shall solicit the sale, lease or the listing for sale or lease, of residential property on the ground of loss of value due to the present or prospective entry into the neighborhood of a person or persons of another race, religion or ethnic origin; nor shall he distribute material or make statements designed to induce a residential property owner to sell or lease his property due to a change in neighborhood.” If realtors were found to have violated the rule, then after a public hearing on the matter whereat evidence and testimony could be examined, those found guilty of “blockbusting” would face either a suspension or a revocation of their realtor’s license. In its 1961 annual report, the Secretary of State’s office noted that every licensee in the state was given “the text of the prohibition…with the information that the Department [would] take disciplinary action against offenders.” New licensees, then, such as Gerald Kutler or any others who began working in real estate after June 1961, were made fully aware of not only the illegality of “blockbusting,” but the dire consequences of its practice. Despite these warnings, Gerald Kutler and his colleagues began to shake hands and ring doorbells in the North Bellport area in May of 1962. That “situation,” however, is exactly what the defendant’s attorneys spent most of their time in oral arguments attempting to tease out. In the case of Ladner in particular, she and her husband had been fully aware of their new neighbors when she called upon Kutler to view her home and make an offer. For the couple, the lowest price they could accept was $11,500, which was roughly two thousand more than what they were offered. With that, their interest in selling dissipated. According to Kutler’s attorney, however, that interest is what had originally prompted the in-person encounter between Ladner and the defendant. If she had called the realtor, then clearly she had wanted to sell the home. Therefore, they argued, there was no reason for Kutler to attempt to induce a sale. For the attorneys, the obvious reason for Ladner’s interest in an estimate was based purely upon the fact she and her husband were concerned that an African American family had moved into a home on their block. Had Kutler offered to buy her home for what she and her husband believed it to be worth, she may have sold the home and moved out of the neighborhood. Since he did not, they did not, and the house was no longer for sale as of the date of the hearing. Interestingly enough, however, Ladner testified that even though Kutler had offered her two thousand dollars less than what she and her husband wanted for their house, he had, just about a week before, sold a different home on the same block to a white family for $12,500. This was one thousand dollars more than what the Ladner’s home was supposedly worth. Since the neighboring African American family lived only two lots to the left and the new white family lived only two lots to the right of the Ladners, it was clear that Kutler’s purchase and resale pricing was based upon not only racial demography, but profit motive as well. Throughout the postwar period, this was the business model employed by “blockbusting” realtors. As noted above, realtors would purchase homes at prices set well below market value and then resell them at prices above market value – thus guaranteeing themselves a handsome profit. Typically, when “blockbusting” tactics were being employed, the homes were purchased as such from white families to then be sold to minority families. This did not, however, always have to be the case. Since realtors mostly concern themselves with profit and less about crafting neighborhoods, the fact that Kutler may have sold the house near the Ladners for $12,500 to a white family is not surprising. It they were willing to pay the higher price then the home would be theirs regardless of race. That does not mean that Kutler did not originally acquire that house by inciting racial fears and inducing a panic sale with the original homeowner. Whether he did is unknown. In June of 1962, Alice and Frederick Moesta were also visited by Gerald Kutler, meeting him for the first time in their front yard when he approached them and asked if they were interested in selling their home. Just as he had before, when the couple said no, Kutler urged them to reconsider, noting that their “home would soon be valueless” since “they [were] moving in.” The assumption that the Moestas made at the time was that the “they” to whom Kutler was referring were the African American families that had been moving to the North Bellport area in the first years of the decade. When pressed further, Mr. Moesta “got a little peeved,” as he recalled, and told Kutler that “‘they can’t move in if I don’t move out’ [and] with that [I] turned by back and walked away.” With this, Kutler made his way down their street allegedly stopping at other homes in order to hopefully convince other residents to sell. Kutler’s attorneys, however, spent considerable time trying to prove that no inducement was necessary and thus Kutler and his associates had, in fact, not broken any laws or ethical codes of conduct. As noted above, throughout the public hearing the defendants’ attorneys argued that African American settlement preceded Kutler, and that white neighbors had immediately taken offense to their arrival. During cross examination, Kutler’s attorney, William Sonenshine, asked Mr. Moesta if he noticed when the first African American family moved to the “immediate” neighborhood. Q: You didn’t discuss with your neighbors the appearance of a gentleman of color into your neighborhood? A: Of course. Everyone does. Q: Many of them resented it too, didn’t they? A: A lot of people do. Q: Well, sir, when your neighbors were discussing it, did they say that they would put their properties up for sale? A: Quite a few did. Q: And that was long before Mr. Kutler gave you a card, wasn’t it? A: Well, there has always been talk of colored moving into the neighborhood. Despite this crafty argument, Moesta’s statements regarding his neighbors speak volumes about the state of North Bellport’s community in 1962. As Moesta’s wife, Alice, attested to in her own cross examination, residents envisioned their community as middle class; in fact, the area’s homes were classified as “middle-class homes, all frame, [and] privately-owned” by primarily white residents. According to their testimony, when they moved to the area in 1958 there were no black families on their block. By June of 1962, one black family had moved onto their street, with two more to follow by September of that year. Despite their own personal comfort with African American neighbors, as her husband’s testimony denotes, many in the area were uncomfortable with the newcomers. However, this was not uncommon in the post World War II era. As historian Lizabeth Cohen has argued, in the post-World War II consumer culture, most “white families had invested most of their life savings in a home by 1960, [and] fear of racial mixing moved beyond simple white discomfort with sharing neighborhoods and public institutions. The presence of black neighbors threatened to depress property values and hence to jeopardize people’s basic economic security or so homeowners were convinced.” However, as various sociological and economic studies throughout the late 1950s and early 1960s argued, the introduction of African Americans to a neighborhood would not be detrimental to property values as long as “white flight” did not begin. Property devaluation was determined more by the attitudes and actions of the property owners rather than the presence of new settlers on the opposite side of the road. Nevertheless, North Bellport residents feared something about their new African American neighbors. Whether they believed that fear was based upon the race of their neighbors or the economic implication of racial integration is immaterial, for the end results were the same. As the attorneys argued, Kutler and his colleagues – fellow realtor John Flynn, in particular – were only participating in a process begun by white homeowners who desired to relocate. When given the chance to speak in his own defense–a right which Kutler did not employ– Flynn denied that he had made any such statements. However, he did substantiate Vona’s claim that he told her that whites were not interested in purchasing homes in the area, noting that the neighborhood “seemed a little dilapidated.” When asked to explain what he meant, Flynn described many of the houses as having “broken windows, boarded up windows, shingles broken off the sides and shingles also broken off the roof.” His customers, he noted “were not impressed [enough] to spend twelve or fourteen thousand dollars in a neighborhood like that.” At the same time, Flynn testified that the Vona family must harbor racist feelings towards African Americans since she specifically asked him to no longer bring African American clients to view her home. With that, Flynn claimed that he was forced to remove her house from his listings since it was illegal to practice “racial steering” – a process in which realtors steer only white clients toward some neighborhoods and only black clients to others. Within one week, Flynn stated that Vona called his office and asked him to once again show her home to prospective buyers, stating, “I don’t care whether you bring me whites, colored or who you bring, just sell it.” Such remarks speak to her desire, and the desire of many of North Bellport’s white residents, for an immediate escape from a community that they feared was changing. The only question for the hearing officers in September of 1962, was whether that fear was of residents’ own making or if that fear had been influenced by the associates of Captree Realty. In the end, however, all that truly mattered was that the racial composition of the North Bellport area had been discussed in the realtor’s interactions with local residents. This ultimately led to the revocation of Gerald Kutler’s realty license and a thirty day suspension of his employer’s – Joseph J. Fileccia – who was the licensed representative broker of Captree Realty. While Flynn had been originally charged with “blockbusting,” the lack of evidence against him personally led to the ultimate dismissal of the case against him. Despite the involvement of New York’s Department of State and the curtailment of Kutler’s activities in the fall of 1962, by the time he and his associates had been stopped, Kutler had reportedly overseen the sale of over fifty homes in the neighborhood. Moreover, even after he had lost his license, Kutler still “owned fifty-five houses which he was renting in the community.” As the 1960s unfolded, his activities in the first two to three years coupled with his deep-seated involvement as a property owner and an absentee landlord in the years that followed only hastened the demographic shifts that many local residents had originally feared, that he predicted, and that together they made reality. As the first blockbusting case in New York State under Rule 17, the attempt to stop Gerald Kutler and Captree Realty proved successful in its endeavor to set an example for others by halting one particular realtor from manipulating the demography of a neighborhood. Nevertheless, that neighborhood would continue to evolve as the 1960s ended and the 1970s began. As a place and as a community, that has always been the crux of its story. Portions of this article stem from the author’s 2011 doctoral dissertation, Neil Philip Buffett, “Black, White and Green: High School Student Civil Rights and Environmental Activism in New York City and on Long Island, 1968-1975,” PhD diss, State University of New York at Stony Brook, 2011. “Long Island Town Fighting Bias Realty Drive,” New York Times (May 15, 1960), 70; “State Backs Code on Realty Ethics: Indicates It Would Enforce Proposed Rules Against Blockbusting,” New York Times (August 22, 1960), 25. See Arnold R. Hirsh, Making the Second Ghetto: Race and Housing in Chicago, 1940-1960, (Cambridge: Cambridge University Press, 1983) 31-34; Thomas J. Sugrue, The Origins of the Urban Crisis: Race and Inequality in Postwar Detroit (Princeton: Princeton University Press, 1996); W. Edward Orser, Blockbusting in Baltimore: The Edmonton Village Story (Lexington: The University Press of Kentucky, 1994); Andrew Wiese, Places of Their Own: African American Suburbanization in the Twentieth Century (Chicago: The University of Chicago Press, 2004), 243-249; Amanda I. Segliman, Block by Block: Neighborhoods and Public Policy on Chicago’s West Side (Chicago: The University of Chicago Press, 2005), Chapter Six; Wendell Pritchett, Brownsville Brooklyn: Black, Jews, and the Changing Face of the Ghetto (Chicago: University of Chicago Press, 2002), 151; Richard Rothstein, The Color of Law: A Forgotten History of How Our Government Segregated America (New York: Liveright, 2017), 12-13, 95-96, 98-100. Rosalyn Baxandall and Elizabeth Ewen, Picture Windows: How the Suburbs Happened (New York: Basic Books, 2000), 182-193. Osborn Shaw, “Historical Sketch of Bellport,” in Village of Bellport, The Charm of Bellport, Long Island, (Circa 1960s), P 1-2, from the Private Collection of Jeanne R. Paisley, Richford, New York. “How Land Values Have Changed,” Newsday, February 18, 1972, 2; The Nassau-Suffolk Regional Planning Board, U.S. Census ’70: The Nassau-Suffolk Regional Planning Board, Vol. 2 – Color and Race, 1972, 38-41, 51-52; The Nassau-Suffolk Regional Planning Board, U.S. Census ’70: The Nassau-Suffolk Regional Planning Board, Vol. 6 – Income, 1973, 13. Village of Bellport, The Charm of Bellport, Long Island, 4; Edwin S. Voorhis & Son, Inc., Consulting Engineers and Planners, Housing and Neighborhood Conditions in the Hagerman-North Bellport Area (March 1965), 2. found in League of Women Voters of Brookhaven South/Bellport (N.Y.) Collection 245. State University of New York at Stony Brook. Special Collections Department; For more on Bellport Villager’s stigmatization of North Bellport, see Art Beltrone and Mike Unger, “School Order Cuts Into a ‘Split’ Bellport,” Newsday, (27 January 1967), 11. For discussion of place stigmatization, see Julie Sze, Noxious New York: The Racial Politics of Urban Health and Environmental Justice (Cambridge: MIT Press, 2006) 38, 54-55, 91. “Fewer Jobs in the Aircraft Industry. That’s the long term prospect,” The Wall Street Journal, (28 February 1957), 1, col. 5; “Republic Aviation Shuts 2 Branch Plants, Part of Scheduled Cut-Back,” The Wall Street Journal, (6 March 1957), 2, col. 3; “Republic to Shut 2 Branch Plants,” Newsday, (6 March 1957), 19. Report from the North Bellport Taxpayer’s Association on Community Problems in the North Bellport-Hagerman Area, (May 1964), Pages 1-2, found in League of Women Voters of Brookhaven South/Bellport (N.Y.) Collection 245. State University of New York at Stony Brook. Special Collections Department; New York Department of State v. Joseph J. Feleccia, Captree Realty Enterprises by Joseph Feleccia, Representative Broker, Gerald Kutler, John J. Flynn., September 1962. Record number 99187, found in Suffolk County Clerk’s Office, Riverhead, New York. The Nassau-Suffolk Regional Planning Board, U.S. Census ’70: The Nassau-Suffolk Regional Planning Board, Vol. 2 – Color and Race, 1972, 38-41, 51-52. </a>New York Department of State v. Joseph J. Feleccia, Captree Realty Enterprises by Joseph Feleccia, Representative Broker, Gerald Kutler, John J. Flynn., September 1962, 5. Department of State of New York, Service Through Action Annual Report 1961, Legislative Document 1962, No. 99, 7-8. New York Department of State v. Joseph J. Feleccia, Captree Realty Enterprises by Joseph Feleccia, Representative Broker, Gerald Kutler, John J. Flynn., September 1962, Ladner Testimony, 134. Ibid, Gertrude Kress Testimony, 166-175. Ibid, Alice Moesta Testimony, 31, 33. Ibid, Frederick Moesta Testimony, 99. North Brookhaven League of Women Voters, If New Neighbors Are Negroes (Brookhaven Town: League of Women Voters, 1964). League of Women Voters of Suffolk County Collection. New York Department of State v. Joseph J. Feleccia, Captree Realty, Testimony of Jacqueline Vona, 178-179; Testimony of John Flynn, 206-209, 211, 224, 234. For more on racial steering see Baxandall and Ewen, 183-190. Ibid, Testimony of John Flynn, 206-209, 211, 224, 234. Report from the North Bellport Taxpayer’s Association on Community Problems in the North Bellport-Hagerman Area, (May,1964), 2, found in League of Women Voters of Brookhaven South/Bellport (N.Y.) Collection 245. State University of New York at Stony Brook. Special Collections Department.